1. Mix the spices with half the yogurt and stir in the chicken. Marinate for 5-10 minutes. 2. Meanwhile, mix the remaining yogurt with the mayonnaise and stir in the grated carrot. 3. Trim, quarter and remove the core from the fennel, then thinly slice and mix into the carrots. Season. 4. Thread the chicken onto 4 skewers and place on a grill pan under a preheated grill for 12-14 minutes, turning occasionally until thoroughly cooked and there is no pink meat. 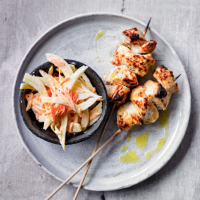 Serve with the fennel and carrot slaw. This recipe was first published in Thu Jun 29 09:30:00 BST 2017.